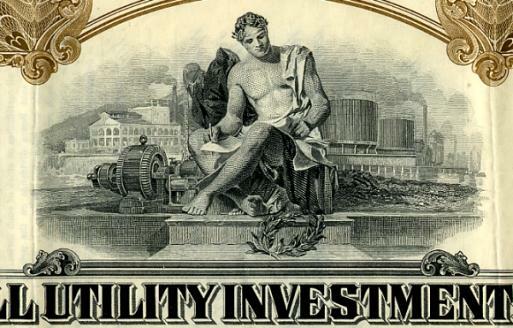 Beautifully engraved certificate from the Insull Utility Investment, Inc. issued in no later than 1934. This historic document was printed by the American Banknote Company and has an ornate border around it with a vignette of an allegorical man sitting down and writing. This item is hand signed by the company�s vice president and secretary and is over 71 years old. The company was founded by Samuel Insull. Born in London, Samuel Insull traveled to the United States to head Thomas Edison's Construction Co. By 1892, he was president of the Chicago Edison Company and amassed a utilities empire across 30 states under the two major holding companies of Insull Utility Investments Inc. and Corporation Securities Company of Chicago. 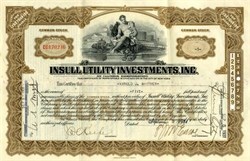 When the stock market crashed in 1929, Insull had to turn over Utility Investments Inc. to his creditors. Resigning from 60 corporations and facing an indictment, Insull left the country. Although he was acquitted of embezzlement, fraud, and violation of the Bankruptcy Act, Insull became an example of the corruption and fraud which contributed to the Great Depression. The revelation of corporate duplicity brought to light during the Insull investigations led to a public outcry for reform and helped to assure the creation of the Tennessee Valley Authority and the Rural Electrification Administration.